The National Institute on Drug Abuse's (NIDA) mission is to lead the Nation in bringing the power of science to bear on problems of drug abuse and addiction. The Brain Power! Challenge program is one effort in trying to reach this goal. Brain Power! Challenge is designed to take students in grades 6 - 9 through a step-by-step exploration of scientific processes and how to use these processes to learn about the brain, nervous system, and effects of drugs on the nervous system and body. Through the interactive Brain Power! Challenge curriculum and the accompanying CD-ROM, students with different learning styles and strengths are given numerous opportunities to grasp the material. In addition, the project's overall goal is to make learning fun and engaging, and to instill in young students a lifelong interest in science. The program involves a series of Challenge activities, one presented per module. Students will form Brain Power! Challenge groups and remain in those groups for these challenges throughout the program. Each Challenge is a competitive, interactive, and educational activity based on the information presented in the module. The Challenge activities are noted with a trophy icon. Details on how to implement the overall series in your classroom are described below. Click on the following links to download the Group Score Card (PDF 60KB), and all Student/Teacher Worksheets (PDF, 668KB) for this Brain Power! Challenge section. Module 1: An Introduction to the Brain and Nervous System - This introductory module provides the foundation for all the modules in the program. It is designed to educate students about the brain and nervous system. Here, students learn the parts of the brain, the functions of these parts, and how the brain communicates with the rest of the body. The process of neurotransmission is described in detail. Following the lesson, students will take part in a Challenge activity, where groups will give visual presentations on brain parts and brain messages. Additional activities include an Internet scavenger hunt, the student magazine, the CD-ROM, and handouts. 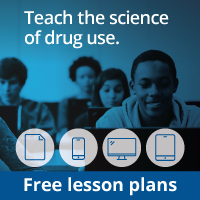 Module 2: Legal Doesn't Mean Harmless - In Module 2, students will learn about two widely abused drugs, nicotine and alcohol, that are legal for adults. These drugs, though legal, can have a strong impact on the brain's functioning. In this lesson, students will learn how nicotine and alcohol cause a number of negative effects on the body and brain, ranging from mild symptoms to addiction. Students will also learn why these drugs are illegal for children and teens. Following the lesson, students will complete a puzzle competition as part of the Challenge series. Additional activities include a mock trial on the legal drinking age, an experiment, the student magazine, the CD-ROM, and handouts. Module 3: Drugs in the Cupboard - Information presented in this module educates students about the abuse of prescription drugs and some household products called inhalants. Abuse of prescription drugs and inhalants can damage the brain and cause serious side effects, even death. Prescription drugs and inhalants are not dangerous when they are used as intended. However, abuse of these drugs can be common because they are legal and easily accessible. Following the lesson, students will participate in a Challenge activity where they will use colored papers to organize facts about these drugs. Additional activities include a public service announcement, the student magazine, the CD-ROM, and handouts. Module 4: Weeding Out the Grass - Module 4 presents information about the most commonly abused illegal drug in the United States, marijuana. A goal of this module is to use science to dispel the myth that this drug is harmless. Marijuana has a strong physical impact on the brain and body. For young people, whose brains are still developing, the effects of marijuana are even more serious. Following the lesson, the Challenge activity is a marijuana bingo game. Additional activities include a research-based presentation, a media log, the student magazine, the CD-ROM, and handouts. Module 5: Drugs on the Street - This module discusses two illegal drugs: heroin and cocaine. These illegal drugs are abused throughout the country, in all kinds of communities. Both have a huge impact on the health of the brain and body. When heroin or cocaine (or both) are abused, changes in the brain occur. Both of these drugs are highly addictive. Students will learn the short- and long-term effects of these drugs, including addiction. Following the lesson, the students will participate in an acronym activity as part of the Challenge series. Additional activities include group research, the student magazine, the CD-ROM, and handouts. Module 6: Drugs in the News - Module 6 presents information about drugs that are commonly discussed in the media. The drugs covered here are steroids, methamphetamine (meth), and so-called "club drugs": GHB, Rohypnol, ketamine, and MDMA. Students will learn about the effects that each drug has on the brain and body, and how use of these drugs affects individuals and our society as a whole. Following the lesson, students will complete their final Challenge activity, which is a long-term media watch competition. Additional activities include a "ripple effects" handout, a debate, the student magazine, and the CD-ROM. Teacher's Guide: The Teacher's Guide outlines the lesson for each module: an Overview of the module, a presentation of Background information on which to base the lesson, a Preparation section to guide the planning of the lesson, an Introduction to begin the lesson's activities, the Challenge Activities and another main activity, a guide to the CD-ROM content, suggestions for Extensions, Assessment questions, and a listing of additional Resources. Handouts and Diagrams: At the end of each module, all related handouts and diagrams are presented for you to photocopy or create transparencies. Student worksheets, with blanks for students to fill in, are always represented by a dashed line border. Teacher copies are noted by the words "Teacher Copy" on the bottom right-hand corner, as these copies contain an answer log. Parent Newsletter: Each module includes a newsletter for parents, in both English and Spanish. Each newsletter includes background information about what the students learned, suggestions for discussing the topic at home, and additional resources. These newsletters can be photocopied and sent home. Online Activites: Online Activities can be used as enriching, learning tools to reinforce information covered in the lesson. We recommend that the activities be used after the lesson is completed, either immediately after or as time allows in the classroom schedule. Review the preparation section. Before each lesson, follow the preparation section to prepare for the lesson. Here, you will find information you need regarding how much time is needed before the lesson can be presented, and what handouts and transparencies you'll need to prepare. Present the background information to students. While presenting the background information in each module, use transparencies or photocopies of the diagrams and handouts provided. Using these tools will make the lesson more interactive and engaging for students. For example, in Module 1, as you review the parts of the brain or the steps of neurotransmission, project the relevant diagrams and label the parts as you go. Complete activities. After the lesson, have the student groups participate in the Challenge series activity. This competition, which continues throughout the program, is a fun and engaging component of the Brain Power! Challenge program. During each activity labeled with this icon, students compete and earn points for how successfully they complete each activity. In most cases, the winners of each activity are chosen at your discretion. Suggestions for this subjective scoring system are provided in the lesson plans. Record points on the Group Scorecard available on page xiii. The group with the most points at the end of all six activities wins the overall competition. You can decide an appropiate reward for the winning team. Assign students to groups. Have each group include 4 - 6 students. Tell students that they will work with the same students throughout the competition. Record names of group members on the Group Scorecard sheet. For each activity, have students sit in close proximity to their group members. If you feel your students are ready for an activity that is harder or better suited for older students, have them also complete the second activity presented in the module. Have students use the CD-ROM. As previously outlined, the CD-ROM providesstudents with an excellent tool to reinforce learning. Each module has an accompanying "room" in the CD-ROM program and contains educational and fun activities related to the information presented in the module. Link the science program to other areas of the curriculum. Many ideas that integrate science with other areas of the curriculum are included in the Extensions section of each module. These activities help reinforce learning by showing students the connections between science and other subjects, including math, English, social studies, business, history, and art. It is helpful to do at least one extension for each module if time allows. Encourage students to use the Internet for research. Many activities in the program outline excellent Internet sites for students to use. The Resources section at the end of each module provides additional recommended sites. At these Internet sites, students can learn more about neuroscience and drugs. Encourage students to take this opportunity to become more familiar with using the Internet as a research tool. Be aware of the sensitivity of students. This curriculum is designed as a more involved extension of Brain Power! The NIDA Junior Scientists Program series for younger students, and thus covers drugs in greater detail. Encourage students to talk to you, the guidance counselor, or their parents if they have questions about the information presented.